Pool Deck Pavers - Tile Tech Inc. The beauty of a swimming pool area (whether it is for commercial or residential use) is dependent on the surroundings. A swimming pool area with no surrounds would be unappealing and would not entice people to enjoy the pool’s cool waters. Rocks and natural rock formations can provide a jungle-like and more natural effect for the pool. However, for many homes and commercial establishments using swimming pools, pool deck pavers are also used to beautify the swimming pool area. A pool paver can be a type of paver (usually rectangular in shape) that is utilized in building an exterior pool area. These pavers can be arranged in various patterns due to a wide array of sizes, colors, and shapes. These pool deck pavers are also highly versatile as their various patterns create interesting and different effects when the exterior pool areas are being landscaped. These pavers are usually made from stone, brick, and concrete. The materials are great for pool use as they can hold off the pool waters’ constant effects. However, one must ensure that the stone can match the poolside paving’s desired effect since limestone, slate, and sandstone are evergreens and their ability in producing matching effects in features in the garden is great. Using these pool deck pavers is beneficial as these pavers promote safety. As the pavers are meant to capture the poolside area’s texture and color, they are also resistant to tear and wear – especially created from human traffic or the chlorinated water’s effects. 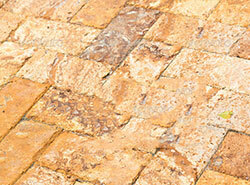 The non-slip properties, which make the pavers safe, enable these pavers to last longer. The non-slip feature allows children to play games and run around on wet and slippery surfaces. These pavers are also durable, affordable, easily installed, strong, and can be repaired easily, aside from coming in a wide variety of designs and is non-slip. These properties are the reasons why people use pool deck pavers in pool areas’ landscaping. They can create a desirable effect by adding to the authenticity and landscaping of the pool surroundings. These pool deck pavers also come in various colors to cater to the customers’ varying needs. One must also know that these pavers must be sealed. The right kind of sealer relies on what kind of finish and texture one would like to achieve. These sealers can enhance the paving’s colors, make the surface glossy, or even prevent staining. These pool deck pavers are important as they greatly add to the pool area’s aesthetic value. The pool itself should be orientated as much as possible in regards to the sun and the best surrounding views. This means that, typically, the afternoon sunshine should be coming from the west, and not at their backs. There are, of course, numerous variances on this, since it depends largely on how the home is situated. If the home faces west, for instance, the pool being typically at the rear of the home will have the most open space facing east. Whenever possible, there should always be a deck area at the pool’s northeast or northwest corner (depending on the region of the country and angle of the sun) to take advantage of afternoon sunlight reflecting off the pool’s surface. Keep in mind for pool deck pavers that the sun angle swings widely over the course of the year.